Marking a ball on the putting green seems like a simple process that shouldn’t cause too many Rules issues, but it is worth considering what is permitted and what is not. • Lifting a ball from the putting green without marking its position first incurs a penalty of one stroke, Rule 16-1b. A ball on the putting green may be marked, lifted and cleaned at any time, except that a ball that might influence the movement of the ball in motion must not be lifted. • The position of the ball must be marked before it is lifted. • There is no limit to the number of times that a player may mark and lift their ball from the putting green, providing they do not unduly delay play. • Before making their putt the player must replace their ball at the exact spot from where it was lifted. • A ball to be lifted under the Rules may be lifted by the player, their partner or another person authorisd by them, Rule 20-1. • If a ball is accidentally moved while it is being marked there is no penalty, provided the movement of the ball, or the ball-marker, is directly attributable to the specific act of marking the ball’s position or lifting it, Rule 20-1. However, moving your ball-marker by accidentally dropping your ball or equipment (e.g. glove or cap) on it is not considered to be directly attributable to the act of marking the ball and incurs a penalty of one stroke, Decision 20-1/15. See this link for detail of Ian Poulter breaching this Rule in 2010. • When marking a ball before lifting it the player should use a small coin or other similar object as a ball-marker immediately and they should place it immediately behind the ball. Note that there is no penalty if a player uses some other object to mark their ball (e.g their putter head, a tee or a loose impediment), providing it is physically marked; it is not sufficient to use an existing mark on the ground to mark the position of a ball, Decision 20-1/16. Also, there is no penalty if the ball-marker is placed other than behind the ball, providing you do replace the ball in the correct position later. Naturally, the traditional method is to place the marker behind the ball and I strongly recommend that all golfers use this method to avoid confusion. • If the ball-marker interferes with the play, stance or stroke of another player, it should be placed one or more clubhead-lengths to one side. There is no restriction as to how a ball is marked to the side. Providing the ball is accurately replaced at the same spot by reversing the exact steps used to move it to the side. • If a ball is replaced at a spot on the putting green other than where it was lifted from and subsequently played from this wrong place, the player incurs a penalty of two strokes in stroke play or loss of hole in match play, Rule 20-7. Have you checked out my three quizzes on the Rules of Golf; General, Match Play and Juniors. Click here for details. in a matchplay competition yesterday, my partner & one of our opponents both chipped to 4' from the hole, several inches apart. After I had my shot, & we were waiting for the other opponent to have his, I noticed there was only one marker 4' from the hole. When queried, the opponent said "I had a tee in the ground as a marker, but pulled it out because it was on my partner's line; there's my mark, that hole in the ground"....??!! I was pretty sure that was illegal, but didn't want to upset the "friendly" match we were having (our golf club against another). My partner putted first, missed, gave the opponent the line, & he holed. Luckily I halved him, & equally luckily we won 2/1. Two questions: did they lose that hole because of the illegal marking? If we had drawn, or lost by one hole, could we have asked that that hole (the 14th) be re-scored as a win for us, or is it too late once we'd proceeded to the next hole? However, under Rule 20-1 it is necessary to physically mark the position of the ball. Reference to an existing mark on the ground does not constitute marking the position of a ball. If a ball is in the line of someone else's putt, the ball is usually marked and then the marker is moved. I have seen people line up a spot with their putter head while the ball is still on the green and then place the mark a putter head length from the ball, returning it, of course, before the putt. Does this constitute correctly marking their ball? In a match, a player used a tee to mark the position of his ball. When requested to replace it with a proper ball-marker because it was in an opponents line of play, the player put a ball-marker without first replacing his ball. Was the player in breach of rule 20-1? Providing the ball was replaced in the correct position (i.e. taking into account the very small difference between where the tee marked the ball and where the ball-marker was placed against the tee) no Rule was breached. Oh dear! Did you ask them to give you the Rule number? There is no penalty for accidentally moving a fellow competitor's ball, let alone their ball-marker. Of course, it has to be replaced. Tell the person to check out Rule 18-4. Are you allowed to swivel or rotate your ball as it lies on the green, without marking it, for example to have the putting line on it visible? No! The action that you describe incurs a penalty of one stroke for purposely touching a ball in play, Rule 18-2a. 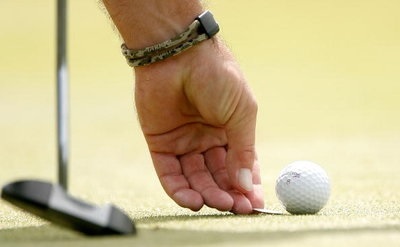 A ball must be marked on the putting green before it is touched, Rule 16-1b. In a four-ball match, I was putting from off the green and my partner was on the green near the hole and pin high. I told him to leave his ball without marking it. Our opponent said to mark it, and that his request took precedence over mine. My partner marked his ball. Was this necessary and correct? b. Have any other ball lifted." I recommend that you also read my blog titled, 'Using a Ball as a Backstop', dated 18th August 2012. I understand the point that you are making, but a player is permitted to move their ball when its position has been marked with a putter head, (though this practice should be avoided. I cannot envisage a situation where it would not be obvious as to whether a player is addressing their ball prior to making a stroke, or marking their ball with a view to lifting, cleaning or aligning it. I play in France and it is a habit for many french players to mark the position of their ball on the green by scratching an arrow on the surface if the green with a tee peg, is this acceptable? This method of marking a ball does not incur a penalty, though in my opinion, it should! Please do everything you can to stop this practice, which can cause unacceptable damage to the putting green. My brother marks his ball using two markers when asked to move his ball off the putting line of another player I.e. He marks the ball off the line then puts a second marker beside the first in order that he will remember to put the original marker back. I find the use of the two markers very off putting when taking my stroke as it catches my eyeline. I have asked him to use some other method but he has refused on the basis that he is not in breach of any rule. While I believe that he is correct and that is no rule breach, I have pointed out that I consider it a breach of etiquette to refuse to accept my request given that I have said that it is upsetting my putting strike. Your opinion would be appreciated ! I think that your brother is being unreasonable. Whilst I do not think that it would worry me to see two ball markers close to my line of putt, the fact that you say that it does put you off, you have asked him to desist from his unusual practice and he has refused, is certainly poor etiquette, though probably not serious enough to warrant a Committee penalising him. Perhaps you could point out that there are many acceptable ways to remind yourself to replace your ball where it was originally at rest on the putting green; for example, I hold my putter upside down, by the head, until it is my turn to putt. Yes, you incurred a penalty of two strokes, under Rule 16-1b, if lifting your ball might have influenced the movement of your partner's ball. The same penalty applies if it was a fellow competitor and not your partner. Playing match play today. Evidently, my ball mark was in my opponent's way when putting. Without asking me to move it, she moved my marker, using her club to measure. Any loss of stroke, point for her moving my marker without asking? My ball was not on the green....in my hand. The ruling here is different in match play than in stroke play. Your opponent did incur a penalty of one stroke for moving your ball-marker without authorisation, Rule 18-3. An opponent chipped onto the green, and his ball stopped close to the pin. Then my partner chipped, and his ball rolled and hit the opponents ball lying on the green, and it was further rolled into the cup. A discussion ensued on whether the opponent should have marked his ball on the green, as a matter of courtesy or not. Please comment. The circumstance that you describe has nothing to do with matters of courtesy. The opponent could have marked and lifted his ball if he thought that it might be of advantage to the player putting, who also had the right to have the ball lifted if they thought that it was going to interfere with the path of their ball. I recommend that you read my blog titled, 'Using a Ball as a Backstop', dated 18th August, 2012. If I mark my ball out of the line of another players putt without asking for his approval do I incurr a penalty stroke? There is no penalty for marking your ball to the side on the putting green without being requested to do so, as you are still accurately marking the position of your ball, before lifting it, but it is good etiquette to ask your fellow competitor, or opponent, before doing so. Placing a ball-marker more than an inch behind the ball probably incurs a penalty. Decision 20-1/20 rules that a ball-marker consistently placed two inches behind a ball does incur a penalty as the ball cannot be considered to have been marked with sufficient accuracy. In my opinion, this is true of a ball that is marked anything over an inch from where it lies. There is no penalty if the ball-marker touches the ball when it is marked. A competitor hit their put & it rolled way off line & hit my ball which was not marked. He assessed a 2 stroke penalty on me, for not marking my ball. I thought my ball should have been replaced where it was without penalty. Is there an obligation for a player to mark their ball. Your fellow competitor was talking rubbish. They were the player that incurred the penalty of two strokes in stroke play, assuming that they putted from on the putting green. You were correct in that your ball had to be replaced where it was when it was moved by the other ball. They had to play their ball from where it came to rest. Once a ball is marked is a penalty incurred if you tap the marker down with the ball or a putter to ensure that it is flat/flush? Hi Barry. Was playing match play today on a course with a local rule that allows moving your ball within the distance of a club. I marked my ball on the fairway, lifted it and placed it but didn't remove my mark yet. I didn't quite like the spot I chose, so with the mark still there, I lifted my ball again and intended to find a better spot. Then my opponent claimed I was not allowed to lift my ball again even though my mark was still there and that should lose the hole as a result. Was he right? Your opponent was almost certainly nearly correct. A definitive ruling can only be determined by rreference to the Local Rule permitting Preferred Lies, but if this is correctly written the ball is in play and cannot be touched again without penalty when it has been placed within the permitted area. What is the ruling if a player marks a ball on the putting green, lifts the marker then puts there finger on the ball but does not move it. Does this action incur a penalty? It happened to a member of a team - she cannot explain why she touched the ball but was penalised by her opponent. I cannot find anything in the rules to cover this incident. Purposely touching an unmarked ball on a putting green does incur a penalty of one stroke, Rule 18-2(i). The score with the ball holed from the correct place stands and no penalty was incurred. See Decision 15-3b/3. When playing in high wind conditions where I have a concern that the wind will cause the ball to move, am I permitted to mark my ball to the side and to then putt while the ball is still marked in an effort to avoid penalty ahould the wind move my ball? The action that you describe is permitted by the Rules of Golf, but has no effect. If the wind causes your ball to move no penalty is incurred and the ball must be played from where it comes to rest, even if the ball-marker still marks where the ball was previously at rest. See my blog dated 15th March 2015, 'Wind Is Not an Outside Agency'. Hi all , my friend today marked his ball on the green ( the wind was blowing hard ) . After cleaning his ball and replacing the ball he then removed his marker . At that stage his cap blew of his head and he had to run after it . On his way back to the green the ball started to move back towards him . My I ask what the rule is ? Brian . The player must play the ball from where it came to after been moved there by the wind, which is not an outside agency, even though the ball marker still marked where it had originally come to rest. Check my blog dated Tuesday 31st March 2015. Yes, a player may mark their ball with anything physical. However, the player will incur a penalty if they lift their finger or foot while they are cleaning their ball. Barry recently in a friendly game I was informed that I had marked my ball incorrectly. My ball was in the line of another member of our group and I was asked to make sure the mark was one putter head to the right. I had not yet marked my ball with a coin at this point and proceeded to pick a spot to line my putter head up with. I moved the ball one putter head then marked with a coin. I reversed the process when it was my turn to putt and ensured that the ball was replaced to it's initial location. I was informed that you mark with a coin first, then move the coin the putter head. While I thought that my group member was correct initially, I do not think that now. Any insight? You are correct. The Rules do not specify how a ball is marked to the side, provided when it is replaced the procedure is accurately reversed so that the ball is returned to the spot where it had originally had come to rest. Two questions if I may, apologies if they've been covered elsewhere. 1) when a player is marking his ball on the green, puts his coin down correctly and just before he picks up the ball, the wind topples the ball an inch or so. Does he move the marker to the new ball position or pick up his ball and eventually replace it where he had the coin down ? It happened to me and I wasn't sure either way so just gave myself no score on the hole (stableford). 2) this one might seem a little ocd ! But when a player is replacing his ball on the green (in the normal way), obviously he places it back in the position it was originally in. I'm just wondering, I'm sure there are many occasions when the ball isn't absolutely exactly on the same spot, like maybe half a millimetre out, or half a blade of grass one way or the other (through no fault of the player), I appreciate this sounds silly, and real life must apply, but is there anything anywhere about just how exact you need to be, or does your best effort suffice ? Now I'm not talking about half a centimetre or anything crazy, just the tiny minuscule variations that may occur. 1) When the wind moves a ball in play the player has to play the ball from where it is moved to. So, in the circumstance that you describe, the player must move the ball-marker to the new position of the ball. 2) The player must try and replace the ball at the exact position where it was lifted from; this is obviously their best estimate. So, if a ball has come to rest in an aeration hole on the putting green and there is no Local Rule providing relief, the player must replace their ball in the same hole. No you were wrong! GUR is an abnormal gropund condition, as is casual water. Would you expect to have to stand ankle deep in a deep puddle, to play a stroke at a ball lying outside that puddle? There is certainly no breach of any Rule in the action that you describe and many golfers, including me, see this as one way to speed up the slow play that can spoil the game. However, if the player whose turn it is to putt says that it distracts them, then it is good etiquette to wait until they have putted. Obviously you can still assess your putt while waiting to replace your ball. My 4 some this past weekend play 2 man scramble and 2 man best ball (4ball). I know Scrambles are not covered by USGA so we let pretty much anything go. My question was in the best ball. My opponents did something interesting while on the putting green. One guy (presumably better at reading) was actually placing the ball down for his partner before and helping to adjust his body before putting. They did this in scramble also, but that seemed more reasonable for that format. Is this legal per 20-3? Seems like it may be legal. Yes, a ball to be placed under the Rules must be placed by the player or his partner, Rule 20-3. A player may also align their partner for a stroke, providing they move away from a position on or close to an extension of the line of play or line of putt behind the ball before the stroke is made. A new member to my club asked if it was okay to mark his ball which was off the putting surface by sticking a tee in the ground. He was told it was okay off the putting surface but if he did it on the green he would incur a 2 stroke penalty. I disputed this quoting 20-1/16. A number of members who have been playing a lot longer than me supported this saying that marking a ball in this way is deemed to be testing the putting surface. A teemay be used but must be laid on the ground. If this is the case surely repairing a pitch mark should carry the same penalty. Can a tee be placed in the ground to mark the ball without penalty? During the stipulated round, a player must not test the surface of any putting green by rolling a ball or roughening or scraping the surface. A new member told me that he was told you don't have to mark your ball on the putting green if it in the path of another ball being putted on the green. Even if the player about to putt requests it to be marked. What Rule refers to this situation, so I can let my friend know? You do not have to mark your ball on a putting green. However if a player considers that another ball may interfere with his play, he may have it lifted, Rule 22-2. In stroke play, a player required to lift his ball may play first rather than lift the ball. A player who refuses to lift their ball when asked to do so should be disqualified by the Committee for a serious breach of etiquette. A member at a local club said the pros are required (I think he said they have a "special rule") to mark and pick up their ball on the putting green when someone else is putting. I am almost positive this is incorrect. Am I right? Thanks! There is no such Rule, but it is good etiquette, which ever player should follow. Mark, lift and clean your ball while another player is putting, so that your ball is not a distraction to them and you are ready to replace your ball and make your putt as soon as it is your turn. I often see fellow competitors replace their ball on the putting green, leave the ball marker in place, step back to have a look at the line of their putt and then return to the ball to align a mark on their ball with the line of the putt. Should they incur a penalty of one stroke for purposely touching a ball in play, given that Rule 20-4 says that a ball that has been replaced is in play whether or not the ball marker has been removed? If so, how can they avoid this? Do they have to replace and align the ball all in one motion without releasing the ball from their grasp? Or do they have to pick up their marker after first replacing the ball and then re-mark the ball before aligning it? Many thanks for your awesome blogs. I addressed this question in another "awesome blog" (thanks!) Status of Ball on Putting Green, dated Thursday, 21 January 2016. http://www.barryrhodes.com/2013/03/marking-ball-on-putting-green.html. Hi Barry. Can you guide us in who can replace a marked and lifted ball on the green. The player, partner or opponent can mark and lift the ball, who must replace the ball. Is it only the person who lifted it? A ball to be replaced under the Rules must be replaced by any one of the following: (i) the person who lifted or moved the ball, (ii) the player, or (iii) the player's partner. I cannot simplify that wording! Hi Barry, i have 2 questions. A) are there any rules specofically defining the shape or size of a ball marker?? B) if a ball on the green is marked, lifted, cleaned, and then put in my pocket until replacing. Must it be r ed placed by the exact ball? Or is any ball in your pocket fine- match play and medal play please, if different ?? A) No, anything can be used to mark a ball, providing it is physically marked, see Decision 20-1/16. B) Yes, the same ball that has been marked and lifted must be replaced, or there is a penalty of two strokes in stroke play or loss of hole in match play, for incorrectly substituting a ball, Rules 20-1 and 15-2. Along the same lines; I placed my mark/coin behind my ball. I left the ball on the green but I then move my mark a club head left. Again with the ball still on the green. Is this allowed? This action does not breach any Rule of Golf, but I cannot understand why you would do it. Presumably, you then have to lift the ball anyway, to take it out of the line of putt of the other player. Hi Barry I have a question. While playing in a match play today my partner picked up her marker on the green but forgot to place her ball. She never moved from her spot, realized right away what she did, placed her ball at the same spot. Should she have gotten a penalty? As she subsequently replaced her ball in the correct place her penalty was just one stroke for purposely touching her ball in play, Rule 18-2. A player marks his ball-marker behind the ball and lifts the ball from the green. Then he mistakenly places the ball behind the marker (not in front) and lifts the marker. Before putting, his fellow competitor warns him that he replaced the ball at the wrong spot. If the player, before putting, marks the marker in front of the ball and then replaces the ball correctly in front of the marker, would that be okay? Yes, this is a similar situation to marking a ball a putter-head to the side. The place where the ball was originally at rest is known and, providing the player exactly reverses the marking process to arrive back at that spot, the ball will be played from the correct place. Two questions please - A) Do you incur a penalty if you wipe mud off your ball on the green? B) Can you mark your ball on the green by pushing a tee into the surface? A) No penalty. You are permitted to clean your ball when it is marked and lifted from the putting green. B). Yes, although this method is not recommended it is specifically permitted by Decision 20-1/16. We've moved to winter rules in the last few months. I was told (think last year) that when you mark your ball when off the green,that you cannot use the lines to assist alignment when it is replaced. No, that is not correct. A properly written Local Rule for Preferred Lies will include the words, "A player may place his ball only once, and it is in play when it has been placed (Rule 20-4)", However, that does not prevent a player from using lines on their ball to align it as they place it. Recently in a Fourball (4BBB) competition, a situation arose when a pair played the competition on their own as a pair and marked the card themsleves. Yes the Committee were correct in disqualifying the four-ball side. In stroke play, a competitor (or side in 4BBB) may not play a single hole without a marker, let alone a whole round, Decision 6-6a/2. The below is being cited to almost override the 6.6 rule. Thoughts? The important phrase is, "Where the context so admits.." Ask this doubter to show anywhere in the Rules/Decisions where it states that a competitor may also be their own marker. It is a ridiculous suggestion, as is the claim that the R&A's 'Spirit of the Game' absolves a Committee from applying Rule 6-6. My local club uses a golf ball with a nail through it to mark nearest the pin on par three holes. Is it a penalty if your ball hits the marker when putting from the green? There is no penalty if a ball strikes this movable obstruction and the ball must be played from where it comes to rest. The player should probably have moved it before putting and then replaced it at the same spot, or a point that was equidistant from the hole. If I am off the green, do I have the right to have other players not mark their ball(s) that is(are) on the green? No. It works the other way. The other players in the group may mark and lift their ball if they think that it can assist your play. Hi Barry - is it allowable to replace your ball on the putting green whilst someone else's ball is in motion? I always thought it wasn't, but can't find a specific rule. I recommend that you look up Decisions 16-1b/2 and 16-1b/3, which are relevant to your question. There is no penalty to either player, even if the replaced ball is then hit by the ball in motion, providing the action was unintentional, i.e. the ball was not replaced to purposely divert the other ball.